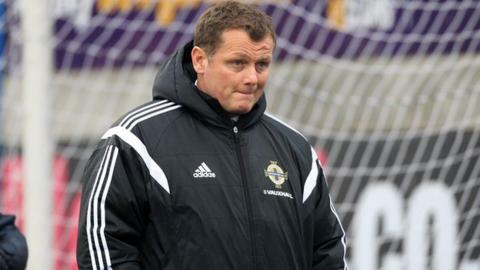 Northern Ireland Under-21 manager Jim Magilton sees cause for optimism as his squad prepare to wrap up their European qualifying campaign against Serbia. The standings show Magilton's side rock bottom in Group 9, with only three points from their seven matches. The NI boss is using different criteria to determine success and failure. "The whole point of these championships is to provide invaluable international experience for our young players and exposure to different teams," he said. Serbia have plenty riding on Tuesday's game as they remain locked in a three-way battle with Belgium and Italy at the top of the group, but for Northern Ireland, a ticket to the Czech Republic has proved well beyond them. While admitting his side had struggled to cope with the quality of Italy, Belgium and Serbia - while winning one and losing one against Cyprus - Magilton believes there are several positives to take. "It's all about experience and exposure to different teams, countries and football formations and tactics which will equip them, not only to forge full-time careers in the game, but to provide the senior international team with more possible players to select from - players who are battle hardened and ready to make the step up to the full international stage,"
"It was pleasing to see some of the Under 21s such as Luke McCullough, Liam Donnelly and Ryan McLaughlin making the step up over the summer during the matches in South America." Magilton will once again look to the future with a number of younger players coming into the side to gain their first experience at the U21 level. "On Tuesday we will be attempting to sign off our campaign with a flourish, in the knowledge that success can breed success and at all levels momentum is vital."